Thrift store makeovers are my favorite. I love scouring the aisles of thrift stores and flea markets looking for my next project. Right now with the Marie Kondo organization craze, thrift stores are a gold mine with everyone decluttering and organizing their house, leaving some pretty awesome things up for grabs. Our DIY project challenge this month was to upcycle a thrift store find (see the befores and afters of my TV table). 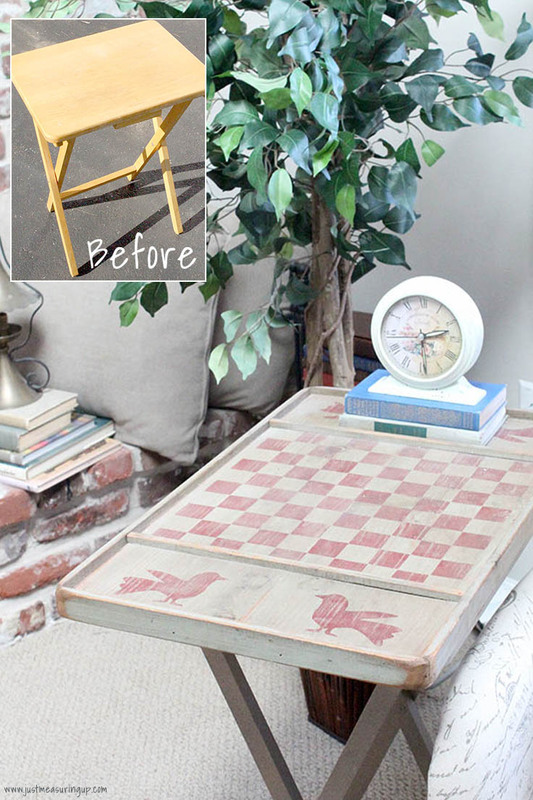 I’ve got some amazing upcycled thrift store makeovers to share with you. 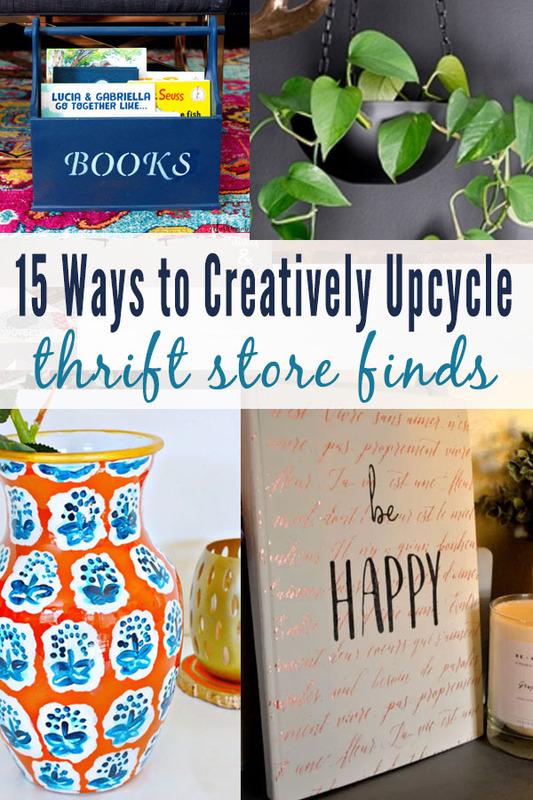 Not only will you be saying, “Why didn’t I think of that?” but you’ll also be running to the thrift store to look for these items to repurpose. How gorgeous is this light cover fixture?! You would never know that Randi from Dukes and Duchesses made this beautiful light fixture cover from an old fan that she found at a junk sale. It definitely looks like a fancy light fixture from one of the home decor stores that you’d pay top dollar for. 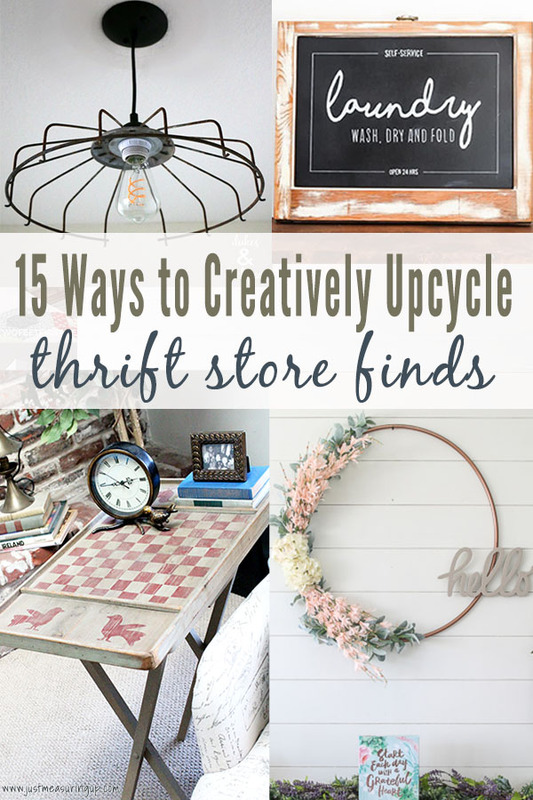 I’ll be keeping my eye out for old fans when making my thrift stores rounds – this is a perfect example of an awesome upcycle. Looking at this pretty laundry room sign, you wouldn’t think that it used to be a window. Megan from Two Feet First upcycled an old window into a stunning laundry room sign. She shared all the details including how she got perfect lettering, without using any fancy machine. Even if you don’t have an old window, you should definitely check out her lettering techniques for your next DIY sign project. That gorgeous spring wreath was made with a hula hoop! Spring wreaths can be so expensive at the crafts and home stores, but Carmen from Living Letter Home made this amazing spring wreath from a $1 hula hoop. She gives all the details on this elegant dollar store transformation. Seriously, I would never know that it was a hula hoop! It makes me wonder what other creative upcycles can also be made with hula hoops. This rustic side table was made from a TV tray table. You know, those folding ones that are super convenient but not that pretty?! We added a new top and gave it some fresh paint, and it looks like a whole new table. Not only is it a great side table (it’s the perfect height for an arm chair), but it’s also a fun game table. How amazing is this beautiful buffet?! Kenya from Kenya Rae transformed a mahogany double dresser into a modern buffet, turning the drawers into shelves and giving the piece a combination of wood and painted finish. There’s so much used furniture at thrift stores, and this thrift store redo reminds of all that potential. 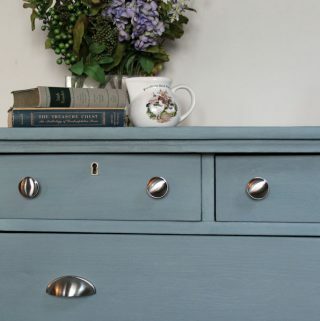 Usually second-hand furniture doesn’t always look pretty, but if it’s good wood, you can definitely redo the piece. Kenya’s tutorial is super detailed on the steps she took to redo this old dresser. You won’t believe the “before” on this colorful vase. Anam from Delicious & DIY turned a common clear vase into this gorgeous Anthropolgie knock-off. I am just floored at how she DIYed this! Thrift stores have aisles and aisles of vases that look like the “before” on this one, making it an easy thrift store DIY to find and recreate. Be sure to check out all the details on how she painted the beautiful vase. 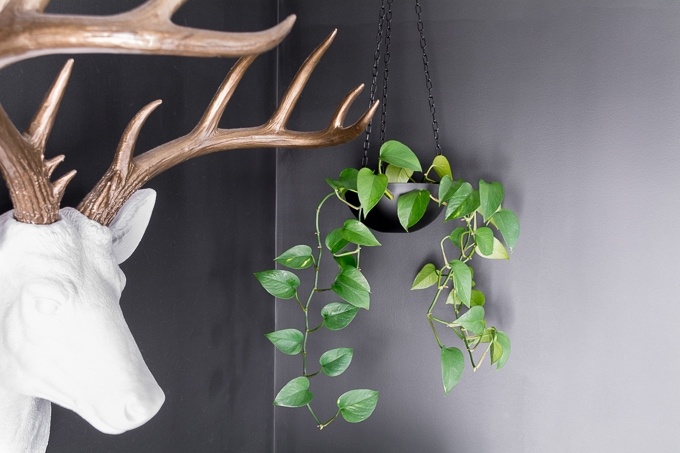 This pretty hanging planter was formerly just an old bowl sitting around the thrift store. Brittany from By Brittany Goldwyn transformed the silver bowl into a beautiful modern planter. 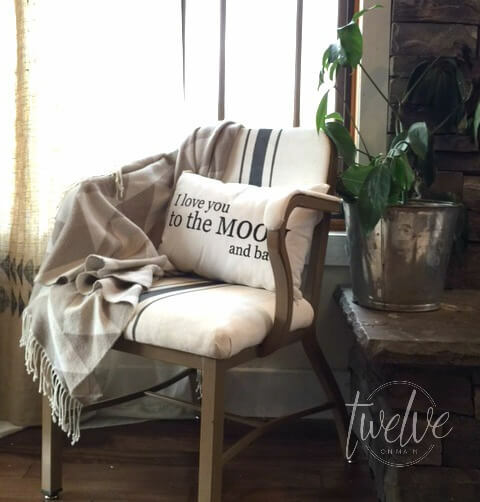 Sara from Twelve On Main reupholstered a basic chair into a beautiful farmhouse seat. This is another thrift store upcycle where you won’t believe the before picture. Chairs like this one usually cost an arm and a leg, and Sara spent only 8 dollars on it! Even though she reupholstered the chair, there was no sewing involved. That’s my kind of project. This farmhouse thrift store chair makeover turned out so pretty. 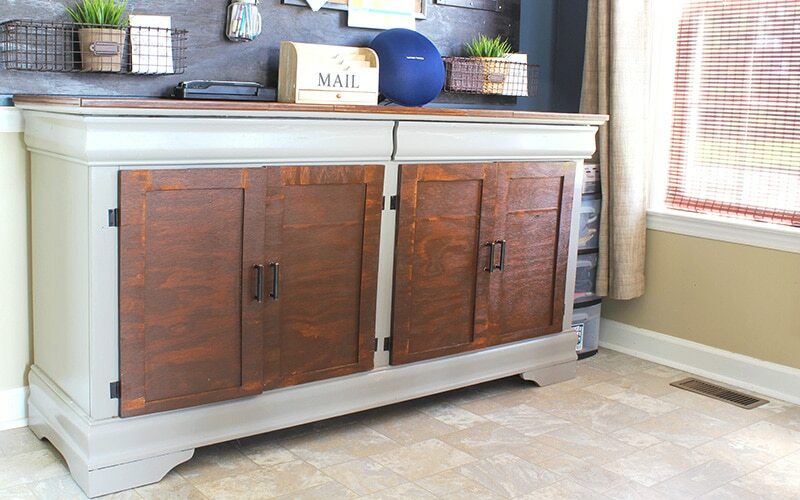 Be sure to read all the details on how Sara completed this amazing thrift store redo. Thrift stores have tons of old books, and here’s a creative way to give a farmhouse thrift store makeover. Amy from 1905 Farmhouse turned old books into farmhouse decor with stencils and paint. So pretty, right?! Old books are the perfect farmhouse decor when upcycled, and these beautiful stencils are spot-on. This elegant spring decor, holding cheery flowers, was made from an old spice rack. Amy from Health, Home, and Heart totally brought this old piece into modern day with her creative spring vision. She always adds the perfect touches too, like the cute hello sign. Definitely check out her post to see the before picture of her amazing spice rack transformation. You won’t believe this DIY from Toni at Girl, Just DIY. This beautiful mirror was once a stained glass lamp shade. 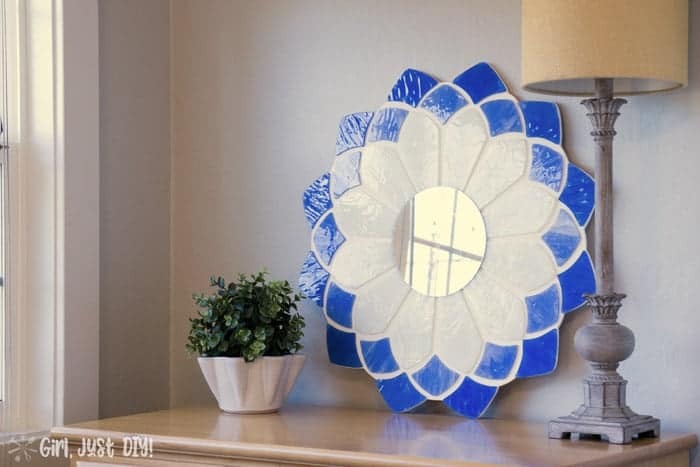 You have to see the “before” to take in just how incredible this upcycled mirror is. Toni found the old light in a pile of trash on the curb. After cleaning it up, she realized its potential. She shares all the details on this highly creative transformation, so be sure to give it a read. I’ve definitely donated a couple of these stained glass lamp shades, never realizing they had upcycling potential. 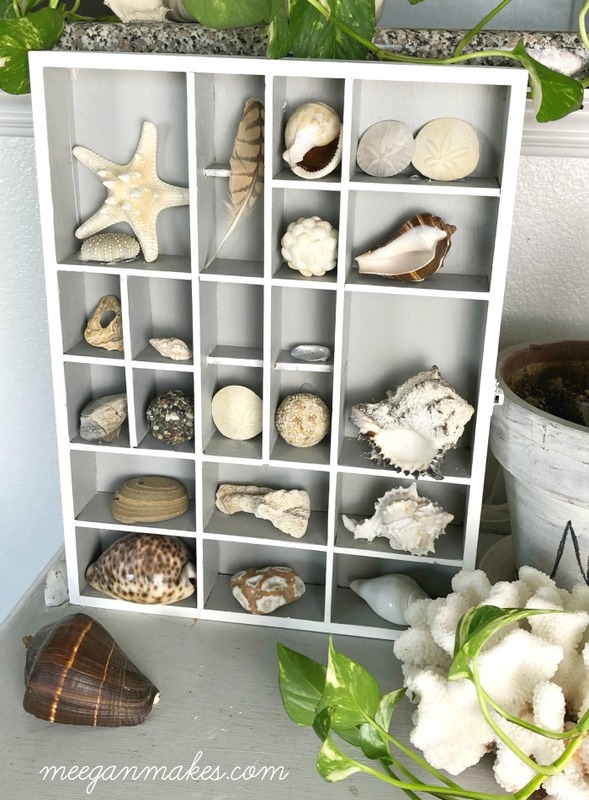 This old shelf was turned into a coastal shadow box by Meegan at What Meegan Makes. The colors on this upcycled decor shelf are gorgeous, and I love the coastal vibe. It’s amazing what fresh paint can do to an old piece. Christine from The DIY Dreamer had this amazing idea to make this headboard made from picture frames. It’s so creative and so pretty – it adds a perfect touch to bedroom without having to make or buy a typical headboard. There’s tons of frames at thrift stores. I’m always donating old frames too. But, now my wheels are turning! 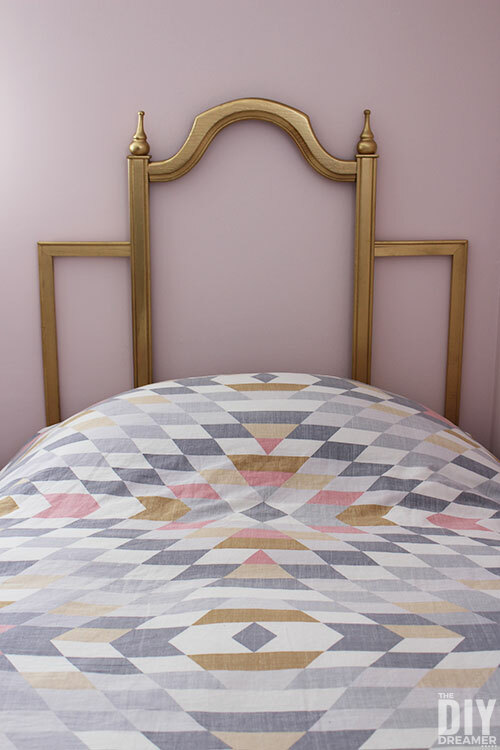 If you can make a beautiful headboard with old frames, the possibilities are endless! If you’re running out of places to store things, such as kids books, see if you can score an old toolbox at the thrift store. 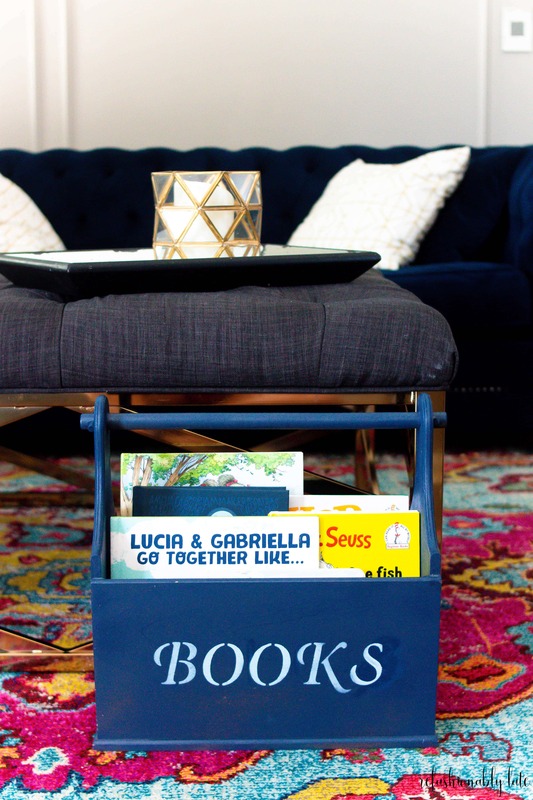 Ruthie from Refashionably Late turned an old toolbox into book storage for the kids using paint and stencils. 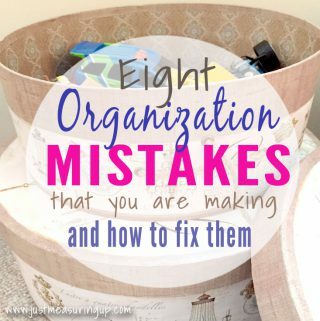 Baskets and storage bins can definitely add up – organization is usually not cheap! 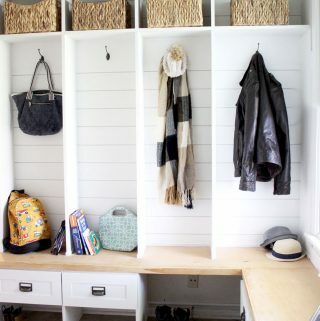 However, this creative, easy idea is a great way to be organized and save a few bucks. This CD tower was practically out to the curb (who has CDs anymore?!). 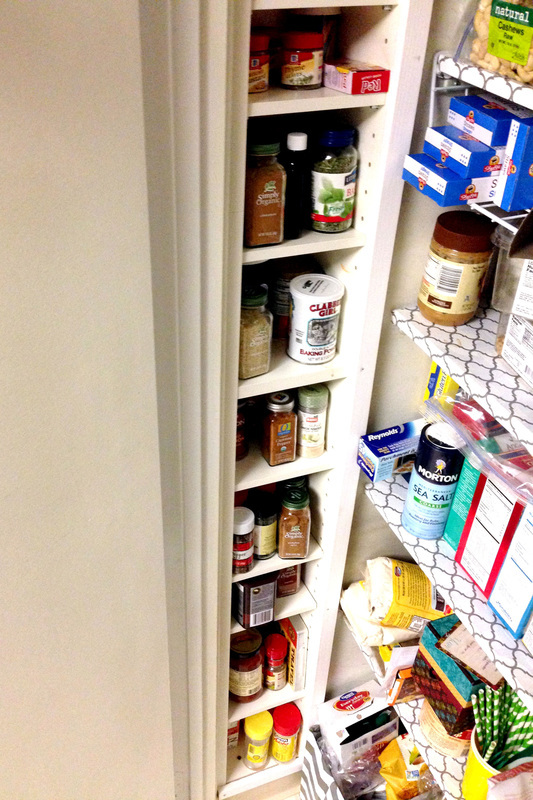 Until an idea struck… It was the same size as a hollow wall in our pantry, making it the perfect pantry shelf to store all kinds of spices and baking supplies. How amazing were these 15 thrift store redos?! 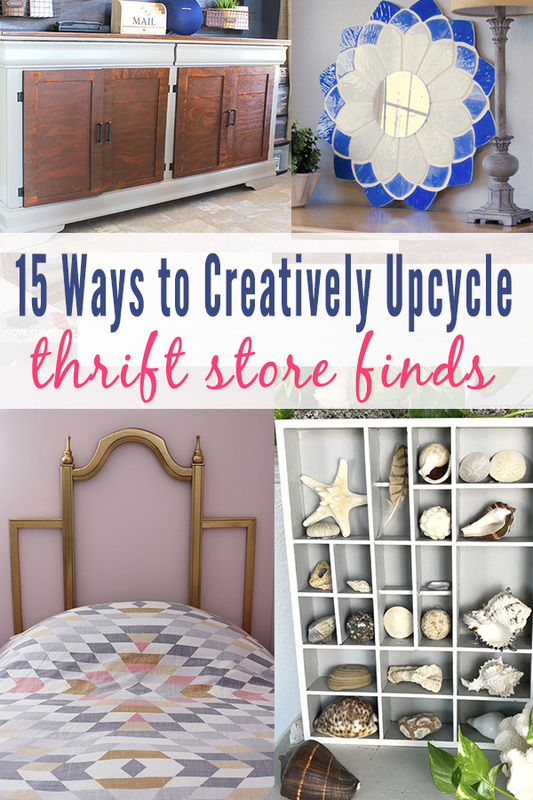 From upcycled furniture to farmhouse makeover to creative home decor, these thrift store makeovers are creative and easy to do, especially with the detailed tutorials. Thrift store finds are so great as they cost next to nothing and give us a good project to work on. There’s no buyer’s remorse if it doesn’t turn out as expected either. On the flip side, if your thrift store makeover turns out amazing, it’s a pretty good feeling knowing you spent next to nothing and recreated something pretty cool.